A charging station in Beijing. Of the global sales of electric vehicles (EVs) last year, China contributed more than half. And that trend is very likely to continue. 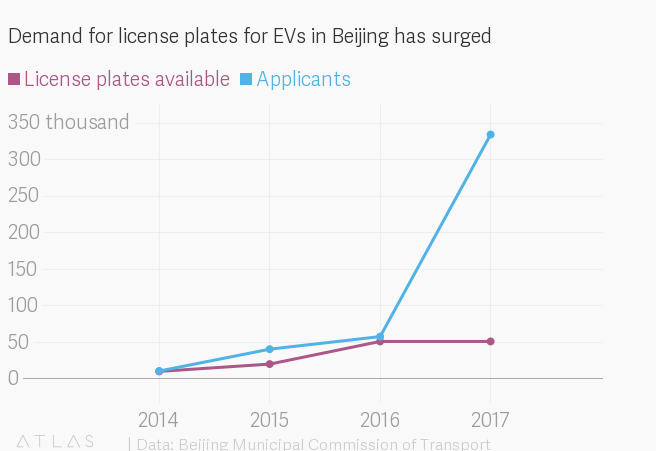 Just look at this one sign—in Beijing alone, the number of people who applied for a license to own an electric car already surpassed this year’s allowed number more than five times. The Chinese capital’s transport department effectively has a quota for the number of new cars each year—managed by limiting the number of license plates it issues. As recently as 2014, the number of applicants for available electric car plates was roughly the same as the number available. The number of applicants per plate changed dramatically last year. Nearly 290,000 applicants (link in Chinese) in Beijing are waiting to get a car plate for “new energy vehicles,” which in China includes EVs and plug-in hybrids, according to data the Beijing Municipal Commission of Transport put out on Saturday (June 9). But the city only has a quota of 54,000 (link in Chinese) for this year. Some might have to wait five years to get a plate, according to (link in Chinese) local news outlet Beijing Youth Daily. 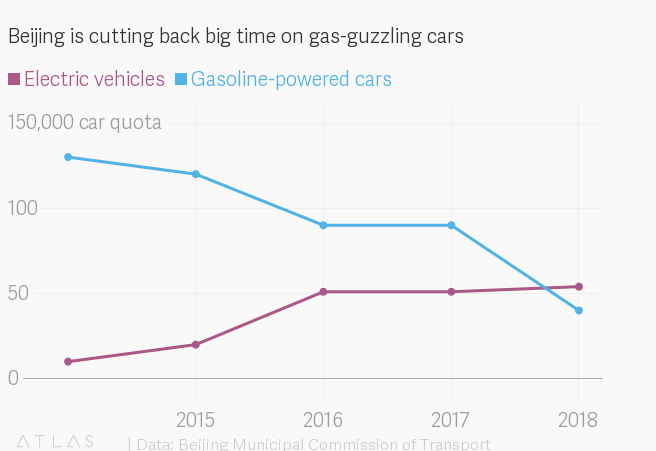 Apart from incentives like tax rebates for buyers of electric cars, the sharp increase is likely because Beijing has been cutting down sharply on new fossil fuel cars, making the competition to get one of them especially fierce. The quota has been cut by a third since 2015, and there are around 2,000 applicants (link in Chinese) for every new car that uses diesel or petrol. Beijing split the quota for cars running on traditional fuels and EVs in 2014, and made it more attractive to go the EV route. To own a car using diesel or petrol, applicants go through a lottery. Applications for EVs and hybrids, on the other hand, are on a first-come-first-serve basis (link in Chinese). Once an applicant receives permission to buy a car, they must do so within one year (link in Chinese) or lose the permit. The surge in new applications for EV cars isn’t just in Beijing—in the southern city Guangzhou, which also has separate quotas for applicants for electric and conventional cars, the number of applicants for EVs was four times (link in Chinese) higher in March this year compared to last year. China began pushing the use of EVs and hybrids around a decade (link in Chinese) ago as part of broader efforts to tackle the country’s terrible air pollution problem and reduce carbon dioxide emissions from cars. The market really took off around 2014 thanks to policies like subsidies for local EV manufacturers and building more charging stations. Last year, China also announced a plan to phase out diesel-fueled cars, but there’s no timetable yet.